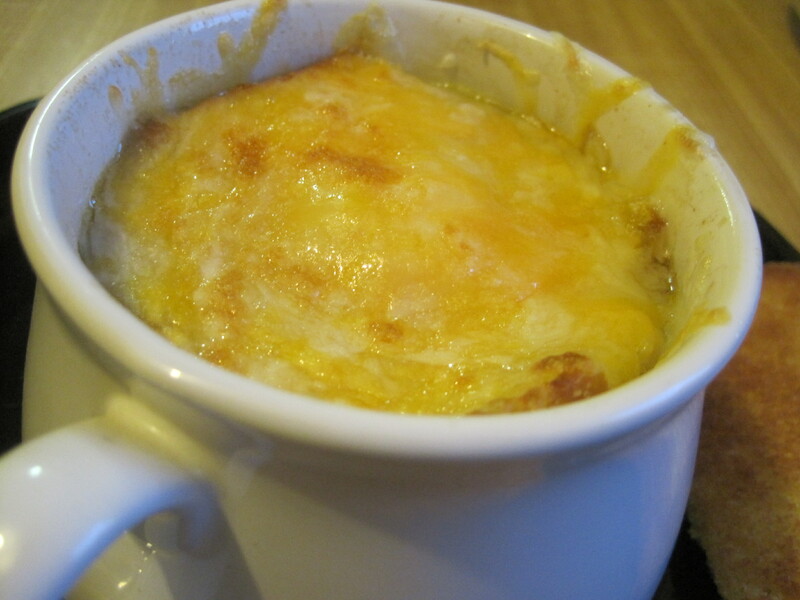 French Onion Soup is really one of the easiest soups to make but you almost always end up with a big batch and as good as it is, it’s really not that popular in our house. Only my youngest daughter and I really crave this. So most of the time, we order it when we’re eating out. Sometimes though, the French Onion soups you order out tend to be a little salty. I don’t know why that is. So whenever we can, we like to make it at home and I can control the saltiness a bit better. So here’s our recipe for French Onion Soup, which if you are a regular reader, you should already expect to be not so authentic like your French grandma used to make it. I don’t have a French grandma. Anyway, you’ll find out as you play with the recipe that it’s actually quite flexible. You don’t have to use Swiss or Gruyere cheese all the time, for instance. For one, it’s hard to find where I live, it’s costly, and I don’t always have it in my fridge for the times when you just have to have soup right now and don’t want to run to the grocery store. So here’s our version for one or two, using ingredients that were in our pantry and fridge at the time. Easy French Onion soup for one or two. In a heavy bottomed pot, melt the butter and add the sliced onion. Add the garlic and let it soften for a few minutes. Add the wine and let it reduce until it starts to look thick. Add the vinegar, thyme, bay leaf and flour. Stir it a bit to incorporate the flour. Slowly add the broth, stirring to make sure the flour is blended in and not in lumps. Simmer for 20-30 minutes until the flavors meld and the broth is slightly thickened. 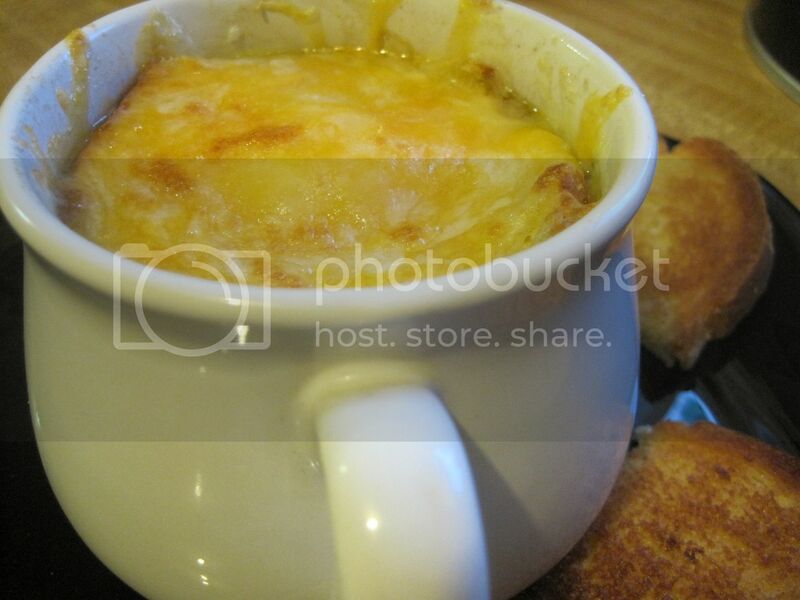 Laddle the soup into oven proof bowls and top with toasted bread and cheese. Place bowls on a baking sheet and put under the oven broiler for a minute or two. Keep an eye on it. When the cheese is melted and bubbly and the edges slightly browned, take it out. NOTE: I didn't specify the type of cheese because, as I've said, we tend to use what we have. Most recipes say Gruyere or Swiss, and they're really good when you have them. Most of the time though, I have cheddar or jack or monterrey or a combination of those. Use whatever cheese you prefer. A little parmesan added to your melting cheese is also very good. A good, crusty French bread would be ideal for this soup. But in a pinch when all you have is plain ol' loaf bread, it would also do. Just toast it nicely. The crispy, buttery edges will mimic a crust. Easy Onion Rings – Slice it UP!